En av doulor a i doula gruppen på Facebook delade ett inlägg som jag råkade se när jag satt i tvättstugan och väntade på den sista, långa minuten innan tvätten är klar. Jag läste och tårarna forsade, SÅ vackert! 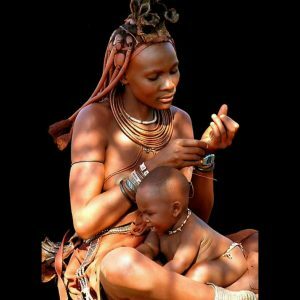 ”Of all the African tribes still around today, the Himba tribe is one of the few that counts the birth date of the children not from the day they are born nor conceived but the day the mother decides to have the child. When a Himba woman decides to have a child, she goes off and sits under a tree, by herself, and she listens until she can hear the song of the child who wants to come. And after she’s heard the song of this child, she comes back to the man who will be the child’s father, and teaches him the song. When they make love to physically conceive the child, they sing the song of the child as a way of inviting the child. When she becomes pregnant, the mother teaches that child’s song to the midwives and the old women of the village, so that when the child is born, the old women and the people gather around him/her and sing the child’s song to welcome him/her. As the child grows up, the other villagers are taught the child’s song. If the child falls, or gets hurt, someone picks him/her up and sings to him/her his/her song. Or maybe when the child does something wonderful, or goes through the rites of puberty, then as a way of honoring this person, the people of the village sing his or her song. In the Himba tribe there is one other occasion when the ”child song” is sang to the Himba tribesperson. If a Himba tribesman or tribeswoman commits a crime or something that is against the Himba social norms, the villagers call him or her into the center of the village and the community forms a circle around him/her. Then they sing his/her birth song to him/her. The Himba views correction not as a punishment, but as love and remembrance of identity. For when you recognise your own song, you have no desire or need to do anything that would hurt another. In marriage, the songs are sung, together. And finally, when the Himba tribesman/tribeswoman is lying in his/her bed, ready to die, all the villagers that know his or her song come and sing – for the last time that person’s song. These Himba Women Invite Baby in Their Womb With a Birth Song! Kolla vad jag hittade på riksträffen!